Welcome! I’m Dr Jen, Clinical Psychologist and I’m so glad you’re here. You sometimes feel a little ‘stuck’ in your work. Perhaps you are supporting people who are struggling to make changes, despite your best efforts. You’re curious about the role of food psychology and whether this skill set can help you work more effectively with the people you’re supporting who are struggling to, ‘eat less and move more’. The truth is, it’s not your fault if you find it challenging to navigate these issues. Most traditional training supports practitioners to learn about the ‘what’ and ‘how much’ of food choices, without teaching how to support individuals with the ‘why’ behind their eating choices. This is the core function of food psychology – the missing piece of the puzzle for many. Once you’ve learned these skills, you’ll feel so much more confident and your results will go from good to great. THERE IS NOTHING WRONG WITH YOU if you’ve been struggling to support some individuals using traditional approaches. For many people, food psychology is the missing link. Food Psychology gets to the root cause of issues with over-eating and over-weight. It is based on the principle that eating extra food and carrying extra weight is serving a function or purpose. Once this function is uncovered, true and lasting change can occur. A food psychology approach supports individuals to focus on the reasons ‘why’ they are eating, rather than concentrating on the ‘what’ and ‘how much’ of their food choices. The Food Psychology Academy teaches a range of psychological approaches to access both the conscious and unconscious drivers for eating, in a step-by-step way that is perfect for those without any psychology background. These step-by-step courses are based on evidence-based psychological models including cognitive-behavioural, mindfulness, psychodynamic, solution-focused, attachment models and more. Take advantage of an exclusive opportunity to learn from a world leading expert in food psychology, at a fraction of the investment of what you’d pay to learn in-person, right from the comfort of your own home or workplace. Hi, if we haven’t met yet, I’m Dr Jen. As a recovered emotional eater, I remember all too well the guilt and shame of struggling with food issues. I understood what I ‘should’ be eating but battled for many years with what I now call ‘non-hunger eating’. Whether it was sadness, happiness, reward or celebration – food was my best friend. It was my guilty, shameful secret, and I thought I was the only person in the world who struggled with these issues. I tried to apply the usual ‘eat-less, move-more’ strategies to my problem, but what I didn’t know then that I know now, is that food wasn’t the real problem. I was using food to solve problems it just wasn’t designed to fix. I trained to be a psychologist and worked with the exact same strategies I now teach in my courses to get the food and body freedom I was looking for. I longed for the health professionals involved in my care (as skilled and dedicated as they were) to ask me about my problematic ways of eating. I didn’t expect them to solve the problem for me, but I did want to be able to talk about my eating honestly, without feeling like I was mad, bad or stupid for not being able to ‘eat less and move more’. Fast forward to today, I now love nothing more than to support helping professionals to navigate these conversations with confidence and ease. For that reason and more, I’m so glad we’ve found each other! I created this training because I remember all too well the shame and guilt of struggling with food issues, without any hope or doorway out. 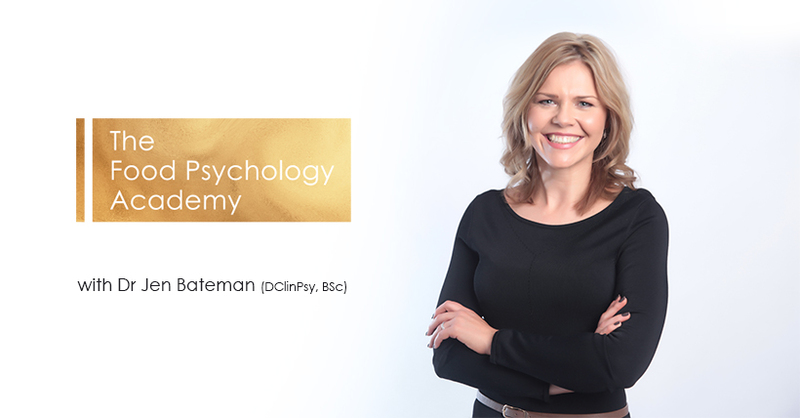 If something that you’ve read has sparked a curiosity in you to know more, then I’d love to invite you to explore joining me in The Food Psychology Academy Training. The Food Psychology Academy brings together a vast body of food psychology knowledge, crafted into step-by-step training packages that are simple to apply even in the most time-limited of consultations. It is a truly unique and independently demonstrated approach that supports lasting transformation. Ready to find out exactly what is waiting for you? Learn how to quickly ascertain specific forms of problematic eating, including binge eating, emotional eating and non-hunger eating. Discover the three different Hunger Types and how to quickly identify which hunger type the person is eating in response to. Be equipped with new skills to introduce the topic of non-hunger eating sensitively, with 10 simple to use ‘conversation starters’, so you’ll never be stuck for what to say next. Discover the 30 reasons why we eat, that have nothing do with physical hunger. Get access to a simple but powerful Assessment and Worksheet that you have exclusive permission to use and reproduce time and again in your time-limited consultations. Use this to guide your consultation so you feel on solid-ground at all times. Learn my unique and highly praised 3-Step Focused Eating Strategy. It takes moments to implement no matter how busy your client is and acts as an immediate pattern interrupt. This makes habit change dramatically easier and faster for your clients who are struggling to make changes. You’ll discover how to support people who are eating in response to a range of internal and external triggers, including unwanted emotions, trauma from the past, unhelpful/black and white thinking, ‘feeders’ and emotional sabotage from loved ones and a broad range of other triggers. Discover how to collaboratively identify these and give support even when time is short. This training contains everything you need to implement a food psychology approach in your workplace setting - whether you practice in the NHS, a health, fitness, wellness, private practice or any setting where you are supporting people towards meeting their health and weight management goals. You’ll Also Get Access to the Food Psychology Academy Training for Individuals, containing all 10 modules from Dr Jen’s independently evaluated ‘Find Your Food Freedom’ training. Keep reading to discover everything you’ll have insight to, and you can even choose to put yourself through the training if you yourself are struggling in this area! Discover the crucial mindset switch - learning from those with a naturally healthy relationship with food. Say goodbye to the harsh ‘bootcamp’ mindset and say hello to the warm but powerful ‘Dr Jen’ way. You may have told yourself, “I’ve got no willower/discipline/motivation, “I can’t resist chocolate” but this isn’t the case. You have an ‘Eating Story’ that makes sense of your apparent self-sabotage, and within this module you’ll be guided to easily uncover yours. Willpower is actually a skill, and it’s a skill that many people (including most of the weight loss gurus that you’ve been learning from) have already developed in relation to food. If you haven’t developed it yet, it’s because you just haven’t had anyone break it down and help you learn it yet, in the same way you’ve learned how to drive and other life skills. You’ll discover my unique 6 Steps to Tackling Temptation approach that will get you off to a firm and very practical start on your journey. Much of our eating behaviour happens unconsciously, on auto-pilot. The food is in your mouth before you’ve even realised what you’re doing. Familiar? We’ve all been there. Breaking this unconscious eating is the key to mastering your feelings of freedom around eating– so YOU are finally in control, not the food. This module gives you my simple but powerful 3 Step Process to mindful eating, which takes seconds and enables you to break your unconscious eating with ease. It’s likely you need to forgive both yourself and others to achieve the results you want to with your weight and shape. Confused? There are often important reasons why you may not have achieved the lasting weight loss you want - life experiences, big and small, can lead to needing to eat more than you need to, being bigger in body than you’d consciously like to, or both. Abuse, trauma, grief, loss, bullying, criticism – each of these can affect our self-esteem and sense of worth, and getting in touch with these and coming to peace with what’s happened, is a cornerstone of recovery and releasing the need to carry this extra weight, physically and emotionally. The Food Psychology Academy training gives you tools to do this in a way that is supportive, compassionate and at a pace that you choose. What are you eating away? Food has never just been about fuel for the body – ever since you were a baby and your tears were soothed by your mother’s milk, food has been about comfort, connection and love. Figure out the link between food and feelings and you’ll finally figure out the emotions that lead you to eat, and crucially, discover helpful ways of dealing with your emotions, so food becomes just one. Recognise that food is fun, but so is other stuff too. We all need fun in our lives, and food can be an easy route to pleasure and entertainment. It can become a quick and easy shortcut to saying a much needed, ‘well done’. Until it stops working that is, and becomes more like an act of self-harm than self-love. The goal is to put food in its place-as a route to enjoyment, yes - but just one of many. This step will teach you 100’s of ways to get much needed fun into your life, so you can have a range of ways of getting pleasure and reward. How to think as nature intended. Do you ever find yourself on your way home from a party, day out or holiday, thinking, ‘Why on earth did I eat so much, I didn’t even want that!’ If so, this step will help. To manage your weight you need to know yourself, get in touch with your unconscious beliefs about food and weight, and manage your thinking styles relating to food. Based on evidence-based strategies drawn from cognitive-behavioural therapy, the skill of foresight will give you practical mindset tools to use around food, so that you never feel regret over your eating choices again. Get clear on the inner needs of a Feeder and how to get your freedom back. Are there some people in your life you feel it’s impossible to say ‘no’ to when they offer you food? If so, there is likely an unconscious need in the relationship dynamic, that’s motivated from a place of love or control. This area of the programme will reveal what’s motivating your Feeder, and give you the exact scripts you need to say ‘no’ in a way that leaves you BOTH feeling great-restoring your relationship to better levels than ever before. Fables are both the conscious and unconscious stories we have about food and eating. This area of the programme will take you step-by-step on a process of uncovering your fables with ease. You’ll be shown how to determine which Fables are serving you and which aren’t and how to transform them for massive breakthroughs, almost effortlessly. You’ve probably worked out that your environment can make or break whether you have a ‘good’ day with food. Make life a series of good days by being guided on my process of examining your physical, emotional and social framework, for best success. Master these frameworks and you’ll master the true skill set of maintenance that those with an easy relationship with their body have got figured out. This is the exciting bit. Once you’ve got these elements of your journey mastered, you’ll notice all the head space you’ve got available to use as you wish. How are you going to use yours? This step will guide you on the pathway to creating your best possible life, now you’ve got the pathway to your best possible body. I have gone from being a foodie and comfort eater to not being that interested in food at all… I have lost over a stone in about a month with no effort at all…this really works! Take the Next Simple Step on Your Journey With Me! This training contains everything you need to implement Dr Jen's approach in your workplace setting - NHS, health, fitness, wellness, private practice and any setting where you are supporting people towards health and weight management goals. Food Foundations: Uncover Your ‘Food Story’ that Finally Makes Sense of Your Eating. Food & Focus: The Easy 3 Step System to Make Focused Eating Your Priority. Food & Fun: Getting More Pleasure and Satisfaction into Your Life. Food & Feelings: Discover How to Shift from Eating Feelings to Expressing Emotions. Food & Foresight: Uncover How to Think as Nature Intended. Food & Fables: Revealing Your Inner Stores About Food. Food & Forgiveness: Forgiving the Past So You Can Move Freely into the Future. Food & Feeders: Get Clear on the Feeder’s Needs & Claim Your Freedom Back. Food & Family: Because Weight Loss Doesn’t Happen in a Vacuum. Food and Your Future: Living Your Best Life Now. Congratulations on making this decision for yourself! Whether or not you feel it for yourself, know that this is a defining moment in your professional life. You’ll finally get the a-ha’s that will make sense of the client struggles you’ve been working with AND the simple, step-by-step processes to make changes. I’m so excited to guide you step-by-step through this training, as soon as you enrol you’ll receive your welcome email with all the access details so you can watch the Welcome Video from me to get started. The investment in the training is just £500 (approx $637) - a fraction of what you’d pay to receive this level of insight, education and training if it was delivered 1:1 with a Clinical Psychologist. But you can get started for the early bird pricing of just £397 (approx $507) if you enrol today. DOORS CLOSE for the early bird pricing soon. Remember: all the materials are yours to keep forever, so you can refresh your learning as often as you choose. Get your questions answered by me in a private Q&A email exchange. You can make use of this at any point in the course so you’ll never be stuck not knowing your next step. When you enrol, you’ll be joining a community that is making a difference. Overweight and hunger are two of the biggest problems facing our world today. The Academy is committed to making a worldwide impact on both these issues. When students enrol on a training course, 10% of all profits are pledged to support worldwide hunger charities. By joining the Food Psychology Academy, you’re making a positive impact on the 20 million people on the brink of starvation in our world of food abundance. Be inspired about the ripple effect you are creating. For that reason and more, it’s my honour to support you in this training, and I’m so glad we’ve found each other! You deserve to be equipped to do your best work! Dr. Jen Bateman (nėe Nash) is a Clinical Psychologist, specialising in weight management and diabetes. She is the author of two 5* Amazon rated books, ‘Diabetes and Wellbeing (Wiley-Blackwell, 2013) and ‘Your Weight Isn’t About Food’ (2016). She has collaborated with numerous health companies including Johnson & Johnson, AstaZeneca, NovoNordisk, Lifescan, Sanofi, Lilly, Boehringer Ingelheim, The BI-Lilly Alliance, Merck/MSD, Napp, Omniamed, TREND UK, Takeda, Diabetes UK, DRWF, The South Asian Foundation, Wave Healthcare, MedIQ and Healthspan amongst many others. Jen is an Editorial Board Member of the ‘Journal of Diabetes Nursing’ and ‘Diabetes & Primary Care’. She is a Board Member of TREND-UK and a former Board Member of The National Obesity Forum. She was named an ‘Outstanding Educator’ Finalist in the Quality in Care Awards 2014 and was awarded the honour of a 'World Diabetes Day Hero' in 2012 by the International Diabetes Federation. She has served as an Advisory Board Member and Consultant on numerous strategic NHS health initiatives. Jen has been living with diabetes since childhood and is open about her personal experiences of recovery from emotional eating difficulties, to encourage others who may be struggling. Jen is the Founder of ‘The Food Psychology Academy’, the leading provider of food psychology education for individuals and professionals worldwide. Take two minutes to answer the 5 quick ‘yes/no’ questions you’ll find by clicking this link to access the Free Starter Pack for Professionals, ‘Is Food Psychology the Missing Link in Your Client Success?’ If you answer ‘yes’ one or more of these questions, you can be confident that a food psychology approach will serve you towards providing even more effective support to your clients. Why should I invest in this training? The Certificate in Food Psychology Training gives you the specific tools, teaching, guidance and resources to give you the missing ‘a-ha’ of why your clients have been struggling to lose weight using traditional methods. If you’re tired of not achieving the results you know you can with your clients, are ready to truly understand why they struggle AND how to support them to make the internal changes for different results, this is the solution for you. The training is for you if you are ready to understand food psychology principles and develop your skills in addressing challenging food issues with the clients you support. You’ll be equipped with quick and simple to use step-by-step tools to transform your current client challenges into supportive, collaborative results. You can also apply these insights to your own relationship with food if your interest is a personal one. Your training is housed within our private, member-only website. Each module is filled with step-by-step training videos, done for your templates, resource lists and action guides. You can watch and learn from your computer, iPad, iPhone, or mobile device. You don’t need any technical skills to access the training. The goal is to make your online learning experience as easy and enjoyable as possible. Tired of sitting through 90 minutes video presentations? So are we. That’s why we’ve broken down our core training into short, digestible videos. Each lesson is only 10-20 minutes long. We want you to learn, implement, and take action as quickly as possible without any overwhelm or brain fatigue. No matter what your preferred learning style is, you’ll find the the training delivers. With our multimedia training, you’ll get access to downloadable videos, MP3s, PDF downloads, transcripts, resource guides, templates, and “cheat sheets” of every slide presentation. Can my employer/organisation fund my participation in the training? Yes. Please pay for the training yourself using the links on this page. You will automatically receive a receipt for your payment, however if your employer requires a receipt on company headed paper, please email hello@drjenbateman.com to request this. You can then submit this to your employer to reimburse you. Absolutely. You don’t have to worry about ‘falling behind’. Every graduate gets lifetime access to the training materials. You can revisit and review them at anytime. What level of time investment is recommended for best results? The recommended minimum time investment to complete the training is 8 hours, similar to a one-day training course. That said, the training can be completed in whatever way suits you. For example, you can do one hour per week for 8 weeks or in shorter time intervals that suit you, graduates report participating for 10-30 minutes at a time whilst commuting to work or according to your lifestyle, commitments and preferences. Please remember that all of your training materials are learn-at-your-own-pace, so you don’t need to “catch-up” because you are free to set the learning pace that is perfect for you. If you’ve never listened to any of my free webinars before you can access one here – this will give you an idea of the training I deliver and the quality of content that I offer. If you’ve never seen my free guides before, sign up for one here and you’ll see the quality and style that the training materials will come to you in. Is there a certificate available for CPD purposes? Yes. Once you have completed the training, please contact info@foodpsychologyacademy.com to request your certificate of completion. As this is a digital training, there are no refunds available. All efforts have been made to give you an accurate representation of the training. Any results from testimonials are to provide an indication of what others have experienced. You probably already know that this isn’t a guarantee that you will experience the same results, and that your personal success will depend on how fully you commit to using the content and materials available. Please email hello@drjenbateman.com and we’ll be happy to support you. Our customer service hours are Monday-Friday from 9am - 5pm GMT.